I have a dichotomous personality when it comes to food. I avoid processed food in the house, go to great lengths to find products with no added color, flavors, preservatives or emulsifiers (like that insidious soy lecithin). I make a conscious effort to ensure our meals are not heavy with refined carbs and that vegetables & leafy greens are well-represented in general. All measures to eat more clean and healthy. The less virtuous side of me craves a sweet treat almost every afternoon. On weekends, I am all too willing to bake up a pie to practice my pastry work or bring a freshly baked tart to my sister's house for casual Sunday dinner. 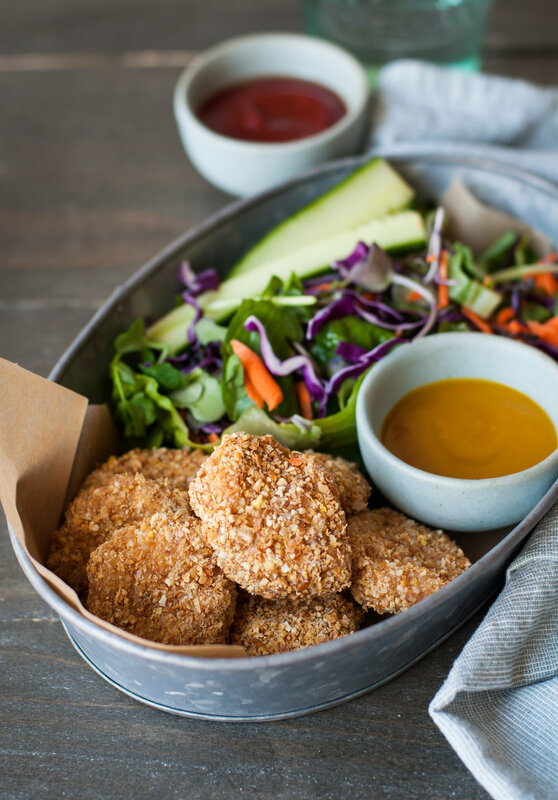 So when the guilt (and weight) accumulates over treat-filled weekends, I turn to wholesome and healthy meals during the week because #balance right? But feeding two young children means wholesome and healthy must still be tasty. This Tomato Egg Drop Zoodle Soup for example, is a go-to weeknight meal for us. It is simple to make (< 30 minutes active prep/cook time; see my note below regarding roasting the tomatoes first), super healthy and extremely slurp-worthy. 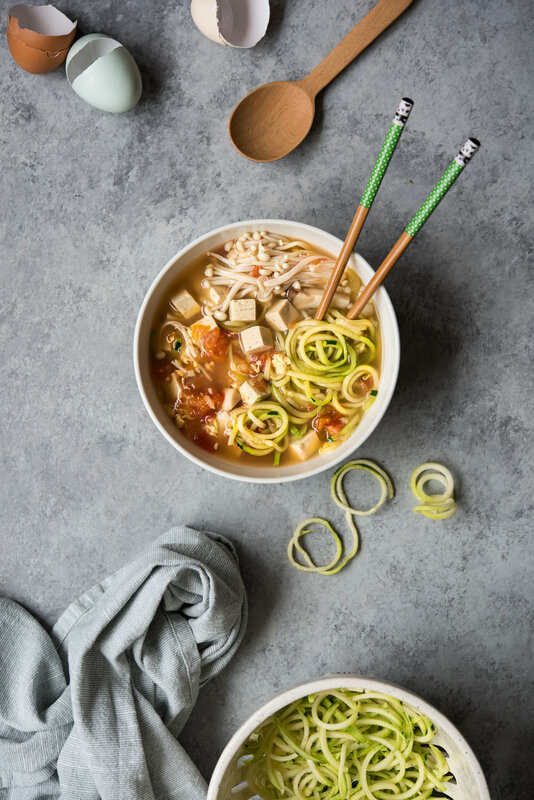 It's based on a Chinese soup I grew up eating, tomato egg drop soup, except I've made it into a meal by adding tofu and noodles, or in this case, zucchini noodles aka zoodles. I use a Paderno vegetable spiralizer to create the zoodles. Do you have a spiralizer? I hesitated for months before finally snagging one on sale for CAD$30 ( albeit in an unfortunate red color) and I am extremely happy I did, even if I make nothing else besides this recipe. This is hands down our favorite way to zoodle! Both of my daughters dislike zucchini but they do slurp these noodles up. Sometimes when I'm being tricky, I don't do 100% zoodles and instead mix zoodles with regular noodles 50/50 which makes the zucchini almost imperceptible. You still get to replace a good portion of pasta with vegetable for a healthier meal. This has worked very well for us in this recipe and for nights we're having spaghetti with meat sauce. I also love to spiralize cucumbers for my Japanese noodle salad. See, already a few ideas for you to make use of a spiralizer too. If you do not have a vegetable spiralizer: My brother in law uses a vegetable peeler to create linguine-like flat ribbons of zoodles. I won't say it is exactly the same because it isn't. His kids both like it which is what matters most as a parent right? 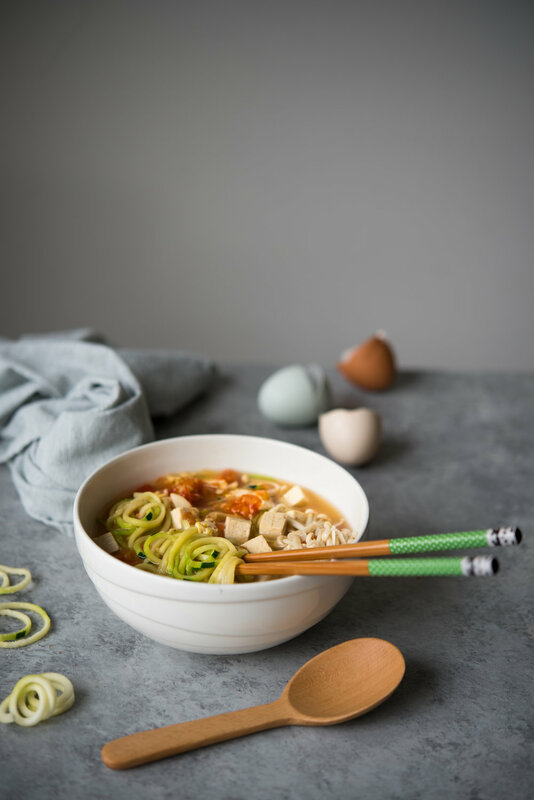 Of course, you can also use actual noodles in this recipe rather than zucchini noodles, and this meal is still chock full of good wholesome stuff (tomatoes and tofu and egg) not to mention the nourishing broth especially if you make your own bone broth which. at the risk of someone punching me in the face for saying it all the time, I can't recommend enough. If going with noodles, my preference is some form of thin and long egg pasta like Taglierini (thinner version of Taglietelle) or similar. Usually the egg pastas (versus durum wheat pasta like Spaghetti) are coiled in nests inside boxes at the supermarket. That's just my preference for mouth-feel but of course you can use whatever you prefer. I'm not the boss of you! To roast or not to roast the tomatoes: If there is time, I always prefer to roast the tomatoes first in a low oven i.e. 250f about 1-2 hours. This achieves two things. One, it deepens and sweetens the flavor of the tomatoes (especially useful if they're not at the peak of their season, which is 10 out of 12 months here in Toronto) and two, the skin peels off fairly easily after roasting and there are no pesky skin bits in the soup. If managing time, you can do this step in advance and keep the roasted / peeled tomatoes in a sealed container in the fridge (or freezer if using more than 2-3 days later) to be used in the soup when you need it. Recipe serves 4. Special equipment: vegetable spiralizer (otherwise use a vegetable peeler to get a similar effect or substitute wheat or other variety of noodles). 1. Preheat oven to 250f. Wash and cut tomatoes in halves. Place cut-side down and roast in the oven for about an hour or more, whenever they are softened and the skin can be easily slipped off. Cut them into bite sized cubes and set aside. 2. Bring the broth to a boil in a large pot. Add roasted tomatoes, mushrooms and tofu (if using, omit for paleo-friendly version) and bring back to a rolling boil. 3. Make the egg drop (or 'egg flower' as Chinese people call it, so poetic :)) by pouring the egg in a small stream down the length of a chopstick or down the handle-end of a spatula, all the while moving it in a circular motion around and around. Or the method my mom swears by, create a strong whirlpool in the soup with the utensil first and the drizzle the whisked egg into the whirlpool. Both helps to create the wispy egg drops aka 'egg flower' as it is called in Chinese. 4. Finally, add in the zucchini noodles and simmer until desired consistency. Some people like it quite raw. For my family, I cook the zoodles to somewhere between the point when they lose the raw crunch but before they get soggy. It's not very forgiving to get that perfect consistency (such that my daughters will eat it) so I stay right over the pot to supervise so as not to overcook. While I'm hovering over the pot, this is the time I take a pair of kitchen scissors and snip the zoodles into shorter, more manageable strands for eating. If you are using wheat or other pasta, you may need to pre-cook them in a separate pot of boiling water before adding them in, with the exception of thin egg noodles which I would add directly into the pot to cook. A hint is to look at the cooking time - if package directs ~3-4 minutes I would cook it right in the broth. For longer-cooking pastas, I would cook separately so as to avoid excessive starch coming out of the pasta and into the broth. Serve in bowls with a bit of everything.